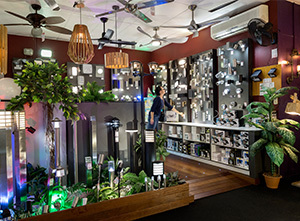 Established in 1994, Galaxy Lighting & Fans (formerly Cairns Lights for Less) is a major distributor for many leading Australian lighting and fan importers, as well as having the unique Galaxy Range of products specifically designed for North Queensland Conditions. With the emphasis on Energy Efficiency and latest trends, Galaxy sets a new dimension in lighting, and with the buying capacity of many sister stores throughout Queensland, Galaxy prices are extremely competitive. With 35 years experience in Electrical Contracting and Installation, Charles and Lorraine Paganini head up the Galaxy Lighting Team. Our team are highly qualified and renowned for their product knowledge and excellence in design. We are locally owned and operated, and are passionate about Lighting. 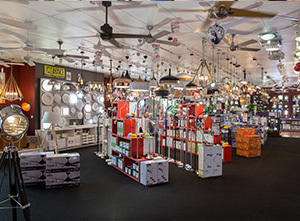 Galaxy Lighting & Fans has the largest range of designer ceiling fans and energy saving LED lights in North Queensland - in stock! If you're looking to change your old incandescent or halogen lights to LED, let our friendly staff show you all your LED options. Whether it's an old hot halogen down light or a flickering fluoro batten, we will have a solution for you. Ceiling fan designs get better every year and now the emphasis is on energy efficient motors. The new DC motor models have arrived and on display in store. If you prefer something with a little bit more grunt, we have a large selection of white metal, plastic or stainless steel high volume 4 blade fans from leading Australian brands. Ventair Pty Ltd commenced operation in 2006, Ventair is a leading specialist supplier of high quality air movement products in the Australian market. Over the last years the EGLO group has evolved into one of the leading manufacturers of decorative interior lighting. 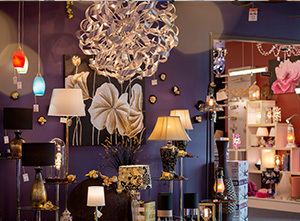 Brilliant’s range of Lighting products cover the entire spectrum of lighting solutions for trade, retail and DIY also. In the past 6 years Atom Lighting has grown at rapid pace thanks to our loyal customers and ever expanding product range to become one of the leading lighting suppliers in the Australian market. Cougar Lighting began in humble beginnings in a 55 Square metre factory in Norwood, South Australia in 1975 and is still is a family owned company. With a 55+ year heritage of manufacturing and distributing lighting products for the Australasian market, Domus Lighting has developed a highly regarded reputation for innovation, quality and reliability. We are focused on continuing that reputation by investing in energy efficient lighting products, using the latest LED lighting technologies. A 100% Australian owned company, established in 1999, on the Northern Beaches of Sydney, we are a leading provider of innovative, high-quality energy saving lamps, trendy lighting fixtures and related products to all commercial, industrial, residential and utility markets.